He finds himself an inspiration to a whole new generation of back-to-the-landers. When Eliot Coleman was in his 20s, farming was just the next adventure, after earlier passions for rock climbing, skiing and mountaineering. Then in 1968, he and his first wife, Sue, went to visit their heroes, Helen and Scott Nearing, the back-to-the-landers in Harborside whose books, particularly 1954’s “Living the Good Life,” continue to influence and inspire young farmers to this day. 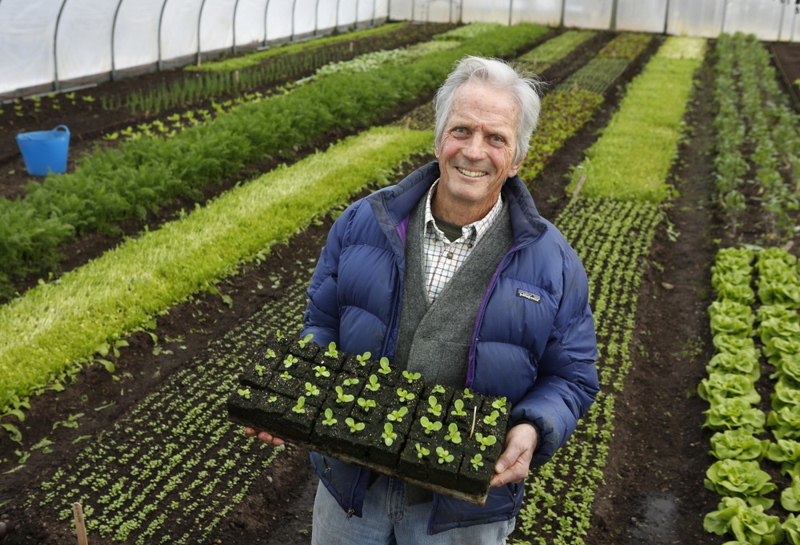 They ended up negotiating the purchase of the back half of the Nearings’ farm; he still farms there with his wife, Barbara Damrosch, a food writer and author of “The Four Season Farm Gardener’s Cookbook.” Coleman, 75, talked to the Maine Sunday Telegram about Maine’s food movement and why his passion for organic farming has never dwindled. We’ve edited the conversation lightly. Q: You’ve been living a Nearing-style good life for almost five decades, farming organically in Harborside on land you bought from the Nearings in 1968. Do you feel like your values are suddenly very fashionable? A: It seems to be a popular thing right now. Everybody thinks this makes sense. The idea of eating decent food, food without junk in it and food that hasn’t been destroyed by processing, is finally getting through to people. Q: Were you a real outsider when you first came to Maine? In the early 1970s I was invited to talk about organic at a local farm meeting, and I was almost knocked over by the palpable wave of hate. Somebody had said to them, “organic farmers want to break all our farms up and give them to the poor.” Once I got past that, I would have been able to tell them about large-scale organic farmers who were actually putting more money in the bank. I could ask them: “Does this interest you, putting more money in the bank?” But no one was listening then. They thought it was all whole-wheat bread and naked hippies. When we got here, there were three generations: the 25-year-olds, the 50-year-olds and the 75-year-olds. The 75-year-olds loved us. We had a root cellar. We talked about that. And we got along very well with the other 25-year-olds. It was the 50-year-old Mainers who just couldn’t bear us – because I had a college degree, which they always thought was going to lead you into ease and wealth, and here I was, cutting stumps out of the land. But the world has changed. The 25-year-olds are 75, like me now, and I get along with everybody. I would say that your average lobsterman is pretty hip these days. Q: Are you as idealistic and/or purist today as you were then? Is there, say, white sugar in the house? Q: You once sought to remove yourself from a world of consumption, living very remotely. No televisions, plumbing, electricity… Today many young farmers are wired and connected. You’ve got email and a beautiful website; how has your thinking about such matters changed? A: I am an information nerd. Even when the only vehicle I had was a 1948 Jeep, I would drive up to Orono at least twice a month to read research papers in the (UMO) library. For a while there, I even got a special library card – I paid them $100 in order to be able to be a first-class citizen. That was my information source. But now I go up there once a year at the most. Because if I come across some published study I want, I can download it. And it is a 100-mile trip to the library and back, so from that point of view, it’s much more energy efficient. Q: Much of the local food movement in the last two decades has been chef- and restaurant-driven. Portland now has a restaurant, Vinland, where the chef won’t even use olive oil because olive trees won’t grow in Maine. What do you think about that? A: When MOFGA (Maine Association of Organic Farmers) put in all their regulations for vendors at the Common Ground Fair, like that you couldn’t use white sugar because white sugars aren’t made in Maine, it inspired all these food vendors to be creative, to come up with new ways to cook things. Regulations like that are really neat. Sometimes if you are writing poetry, it is easier to write a good sonnet than it is to write in free verse. Q: Do you worry that there will be a burnout factor in the craze for farm-to-table? A: No, I don’t see a burnout. I see increased awareness. Most everyone’s great-grandparents enjoyed farm-to-table eating. The processed food industry has worked hard to displace that old connection. But new research is pointing every day to the dangers of what industry has done to our food. Think antibiotics, GMOs, preservatives, bovine growth hormone, artificial colors and flavors, pesticide residues, etc. And, as happened with the dangers of smoking, the new facts are starting to get through. The more people learn about food, the more the idea of reconnecting the farm and the table will resonate. Q: Is this an elitist movement? A: The way I grow food, anybody can do this, in their yards, with compost made for free in your backyard from waste products. I am not buying anything, so how is that elitist? This is just one of those terms they (big agriculture) use to try to put the movement down. And that is how you know they are losing. I don’t think there is any elitism at all. It isn’t like we are saying you are nobody until your wine is Chateau Lafite Rothschild 1957. Compost and vegetable seeds are available to everyone. Q: So many young farmers starting out in Maine look up to you as you looked up to the Nearings. You’ve passed on that knowledge to a lot of people. Did you ever expect to be a granddaddy of this movement? Q: Are you ever tempted to coast on that success? A: When you’re mountaineering, you get to the top of the mountain and find out that is the dullest part. The fun is getting there. I became entranced by the challenge of organic farming. As a rock climber you love the impossible, and back then we were told organic farming was impossible. It has been a wonderful long adventure, because the mountain doesn’t have a top.